The Kovai Kings tasted defeat in their match against the Dindigul Dragons. Dindigul Dragons recorded their second consecutive win in the 2018 Sankar Cement-TNPL as they defeated Lyca Kovai Kings by eight wickets at the NPR College Ground, Natham (Dindigul) on Wednesday, July 18. 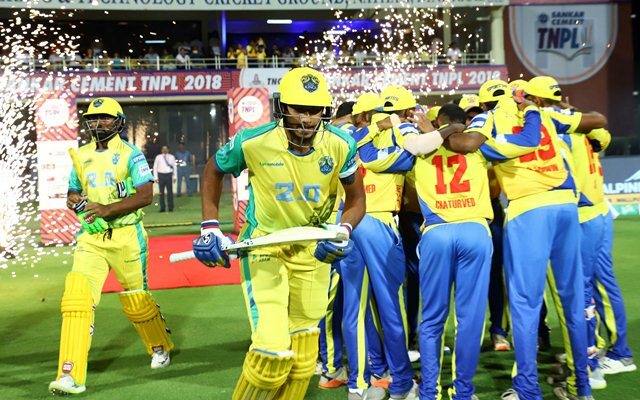 Dindigul Dragons made light work of the 186 runs target set by Lyca Kovai Kings as they managed to complete the chase with eight wickets in hand with 14 balls remaining. The Dragons displayed their batting might once again as they never allowed the Kovai Kings bowlers to dictate the terms. The hero of the night for Dindigul Dragons was NS Chaturved. The 22-year-old right-handed batsman blasted 72 runs from 36 balls with five boundaries and six sixes. Narayan Jagadeesan continuing his fine form scored an unbeaten 66(50b,5×4,2×6). Dindigul Dragons have now won two of their three matches while Lyca Kovai Kings suffered their first defeat. Earlier, Lyca Kovai Kings opener Shahrukh Khan played a stroke-studded 86 (54b,7×4,4×6) while his partner Abhinav Mukund was run-out early in the innings. Wicket-keeper batsman R Rohith was batting dangerously until the bowling captain R Ashwin brought himself on in the attack to castle him. Batting at No 5, Akkil Srinaath stepped up with the bat and raised a smashing partnership of 107 from 64 balls for the fourth wicket with Shahrukh Khan. Srinaath remained unbeaten on 54(40b,4×4,3×6) as Kovai Kings posted 185/5. Lyca Kovai Kings 185/5 in 20 overs (Shahrukh Khan 86, Akkil Srinaath 54, R Rohith 26, M Mohammed 1-29) lost to Dindigul Dragons 190/2 in 17.4 overs (NS Chaturved 72, N Jagadeesan 66*, Prasanth Rajesh 1-18) by 8 wickets.